Believe it or not, Rim Rock crowned snakes can be great to have around – after all, they love to eat scorpions, centipedes, spiders, and other insects. But if they move inside our homes, or their numbers become too abundant, something must be done. Here’s what you need to know when dealing with a possible Rim Rock crowned snake on your property. Rim Rock Crowned Snake ID and Habits - The Rim Rock crowned snake is tan with a white belly. The black on the head is continuous from snout to neck, except that Key Largo specimens may have a broken light crossband separating a black head cap from a black collar. This small, slender snake is about 7-9 inches long – about as big as a large earthworm. This species of black-headed snake is found only in southern Florida, in eastern Dade County and Monroe County, Florida, and the Florida Keys (including at least Key Largo, Upper Matecumbe Key, Grassy Key, and Vaca Key). There, you’ll find it in sandy or rocky soils in wooded areas, vacant lots, and pastures with shrubby growth. 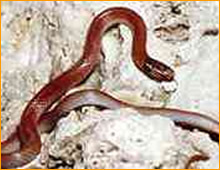 This burrowing snake may be encountered under fallen palmetto leaves, boards, logs, rocks, or other debris. They apparently don’t mind living around people, and can occasionally be found in suburban and rural areas. That’s not necessarily a bad thing, though; their diet includes centipedes and insect larvae that live underground. If you suspect that you have this snake on your property, proceed carefully. The Rim Rock crowned snake is extremely rare, and is listed as a Threatened Species by the state of Florida mainly because of habitat loss. Only 26 specimens are known to exist. If you’re ever bitten by a Rim Rock crowned snake, make sure to get it checked out. These snakes are not venomous, but with any wild animal bite there’s a risk of infection. There are several steps to dealing with snake problems: making your property less inviting to snakes, and dealing with any snakes that are already there. Before undertaking any control measures, however, call your local fish and wildlife department, or a professional snake control company, to learn about the conservation status your snakes might have and which control measures are allowed in your situation. In settings where snakes are common, eliminate stands of tall vegetation and remove piles of rock, lumber, and debris that might attract snakes to search for prey or to seek shelter or hiding spots. Close all entrances to rodent burrows, which are used by snakes as hiding spots and sometimes hunting grounds. Structural gaps and crevices larger than 1/4 inch and within three feet of grade should be closed off – snakes can pass through very small openings. Crawlspace vents should not have screens with larger than 1/4 inch mesh. A thorough search should be made for cracks in the foundation, unscreened crawlspace vents and gaps around basement window frames. Check clearances under doors, and look for improper sealing where plumbing and utility lines penetrate the foundation of the building. If you’re confident that you do indeed have a Rim Rock crowned snake in your house, and you want to deal with it yourself, try this: place a trash can on the side of the snake, and use a broom or a similar tool to gently sweep it inside the trashcan. Relocate it well away from residential areas, and seal up any openings in your house where it can get back in. If you have any doubt about which kind of snake you have, or if you suspect several, a call to a snake control company is warranted. They can also advise you on effective control and exclusion measures and trapping techniques. Take advantage of their expertise if you want to deal with your snake problem quickly and effectively!